Preheat oven to 350°F. Grease and three 7? round pans. Begin by making the vanilla cake batter. Mix together all dry ingredients (flour, baking powder, sugar, and salt) in a stand mixer with a paddle until fully combined.Mix chunks of butter slowly into the dry mix on a low speed. Continue to mix until no chunks of butter remain, and the mixture becomes crumbly. In a separate bowl, combine all wet ingredients (vanilla extract, egg whites, buttermilk, and vegetable oil), and whisk to combine. On low speed, add 1/3 of the liquid ingredients to the dry/butter mixture. Mix until fully incorporated, scraping down the sides of the bowl as needed.Mix in the remaining wet ingredients in two installments, on a medium-high speed until fully incorporated. Set aside. Next prepare the chocolate cake batter. Mix together all dry ingredients (flour, baking powder, sugar, cocoa, and salt) in a stand mixer with a paddle until fully combined.Mix chunks of butter slowly into the dry mix on a low speed. Continue to mix until no chunks of butter remain, and the mixture becomes crumbly. In a separate bowl, combine all wet ingredients (vanilla extract, egg whites, buttermilk, and vegetable oil), and add in instant espresso. Whisk to combine. On low speed, add 1/3 of the liquid ingredients to the dry/butter mixture. Mix until fully incorporated, scraping down the sides of the bowl as needed.Mix in the remaining wet ingredients in two installments, on a medium-high speed until fully incorporated. Add in gel food coloring, and mix until batter is evenly colored. 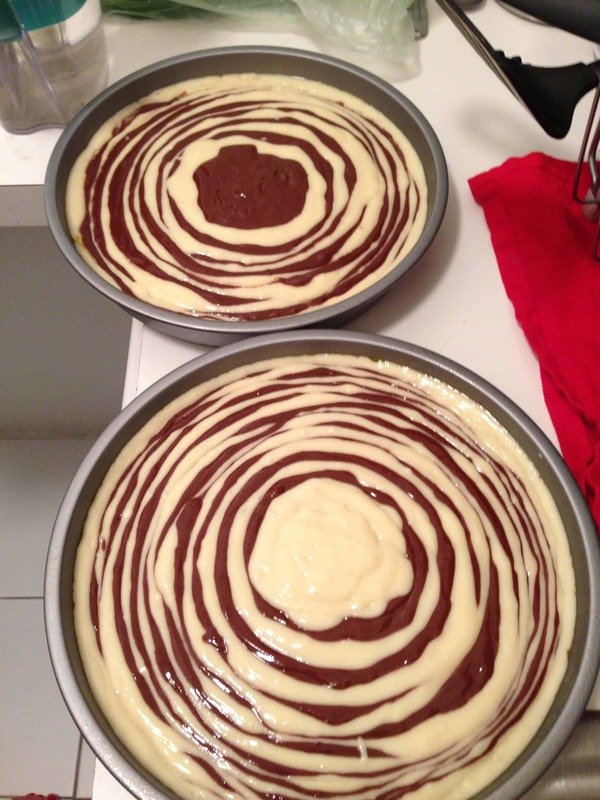 Add alternative scoops of batter into the center of each pan, until you have several alternating rings of chocolate and vanilla cake batter, and you have used all the batter. Bake for 30 minutes, or until a skewer comes out clean. Allow to cool for 10 minutes, then run an offset spatula around perimeter of the pan to separate the cake from the pan. Place cake layers on a rack to finish cooling. To accelerate this process, I frequently place my cake layers in the freezer. 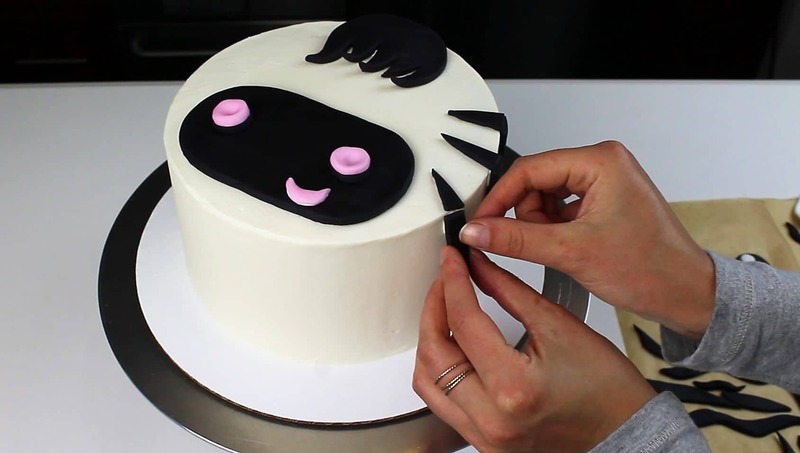 While the layers bake, make the fondant cake decorations. Roll out pink fondant and black fondant to 1/4 inch thickness. 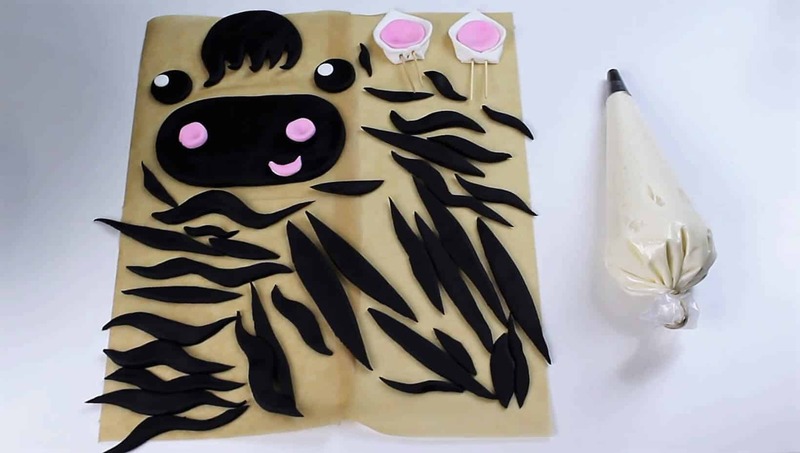 Cut out an oval shape for the snout using black fondant, and add two small pink circle for the nostrils. Use pink fondant to also make the mouth. With black fondant, cut out two small circles for the eyes, and a circle for the mane. I trimmed out triangles from the circle to make it resemble a tuft of hair. For the ears, cut out 2 white fondant squares, that are 1.5 in. x 1.5 inches. Pull two of the corners diagonally into the center of the square, and seal the together with a bit of water (I used a lightly wet small paint brush). I also added small pink circle of fondant to be the inner ear. Cut off excess fondant on the bottom, and insert two toothpicks into each ear. 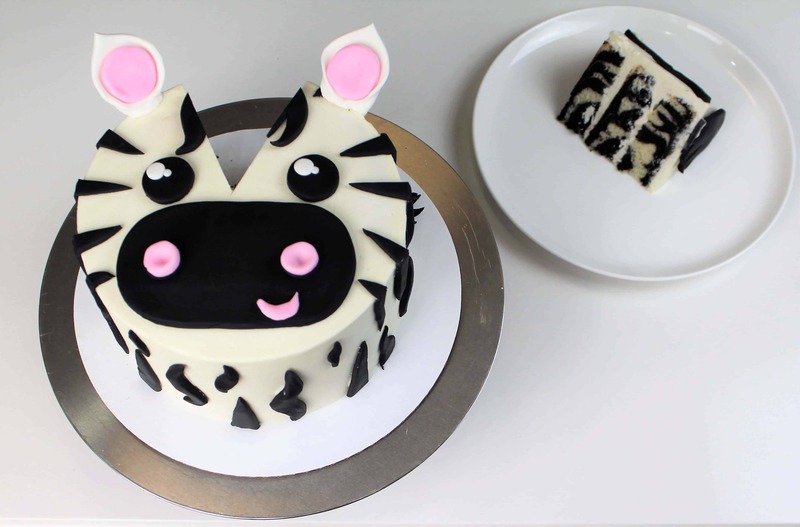 For the stripes, use remaining black fondant to cut out thin stripes, 1 cm wide. Place prepared fondant onto parchment paper to allow it to firm. Next, prepare the frosting. Beat the butter on high for 30 seconds with a paddle attachment, until smooth. Slowly add in the powdered sugar, 1 cup at a time. Alternate with cream, adding 1 tablespoon at a time. Once fully mixed, add in the vanilla and salt, and beat on medium low until the ingredients are fully incorporated, and the desired consistency is reached. If the frosting is too thick, add in cream (1 teaspoon at a time). If the frosting is too thin, add in more powdered sugar (quarter of a cup at a time). To assemble the cake, stack and frost cake layers, then apply a crumb coat. The crumb coat is crucial on this cake, as we have a dark cake base (producing black crumbs) and white frosting!! Freeze cake for 5 minutes to allow the crumb coat to set, then use remaining frosting to add a second layer of frosting. Smooth with a bench scrapper. Secure fondant stripes to the cake using buttercream, and gently press fondant facial features onto the top of the cake. The last step is to insert the ears into the edge of the cake using the attached toothpicks. Then it’s time to cut in and see the fun pattern inside each cake layer! !